First, the growing into motherhood slowly swamps the mind. Chemicals, hormones, awash with the hymn. Studies have shown that parenthood changes the brain's structure, in this case making the auditory areas more sensitive, particulary to distress calls. but how or do the chemical changes impact writing? Do they impact aesthetic sensibility, for example? Do the chemical changes impact the language centers at all? Then there's the mother's lived experience of the body--the mind's curiosities overwhelmed by the body's necessities--the cravings, the aches, the rippingsaparts, which no doubt impacts perspective and perhaps subject matter. Then the newborn's body and its necessities--don't sleep, feed me, hold me, play with me--overwhelm the mother's mind and body. Talk about the decentered lyric 'I'! A friend of mine, novelist Phil LaMarche, recently asked me about my experience of writing as a parent. And poet Josh Corey , who is soon to be a Da, has been blogging about his own questions concerning parenthood, and, in particular, about writing as a parent. So this blogger thought she ought to dedicate some blog space to thinking about how it's going as mother and poet. For one thing, this post initially said "how it's going as mother and parent--which tells you about the difficulty I may be having getting the poet role into the daze of the weak. Since having Sophie, even since embarking on child-bearing, I've felt a connection across the ages to the human or even mammalian experience of pregnancy and birth and passionate affection for my offspring. A creaturely passion. The sense of connectedness further embues writing with importance for me, as its the way we best attempt to pass our consciousness on, to time travel, to survive beyond the unconscious DNA, and its one of the few facts truly distinguishing the human being from other creatures. The question of what it means to be human becomes even more urgent for me as a parent, because I feel I will need to account for why I brought my child into existence. When she wants to know what the point of it all is, besides my own feeble attempts, the written word spanning back to ancient recorded text is sure to help answer her query to the universe. I'm also considering our family history, my own history, and how so much story gets lost to oblivion. Parenting helps me appreciate further the power and importance of writing. Sophie is now throwing toys with vehemence. And finger in mouth. And "Ahhhghshfhghs!!". A wee bit of frothing. 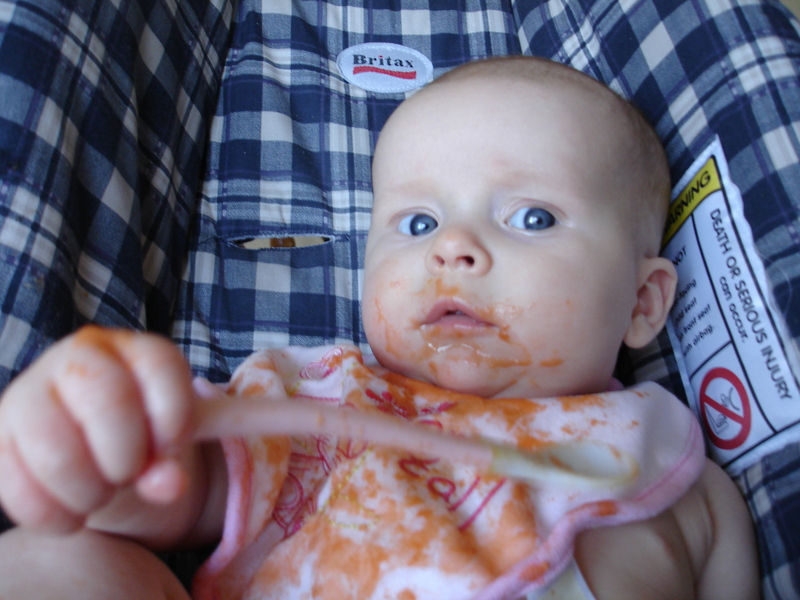 Infant anger: see illustration at table side. In other words, that's it for this post. If you have a manuscript you're shopping around or hoping of found, take note of the current reading period from now till Oct. 31 with the verily good people at Tarpaulin Sky. Send your manuscript. Yes, bloggerissimo, you gno who you are.